Do you need a quick thank you to a coworker for help you received on a project? Someone you know having a rough day and need a pick-me-up? Need a quick I love you note for someone special? Or a way to tell someone that they are pretty amazing, but don’t have $50+ to spend on a gift basket? 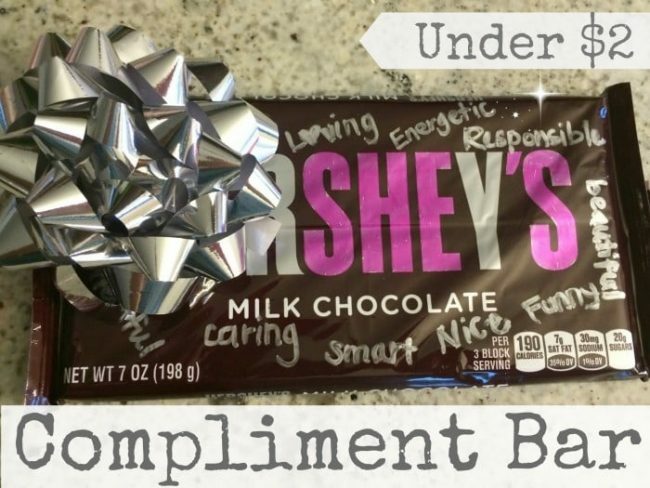 This Compliment Bar is a perfect small gift to brighten anyone’s day. Color in the SHE’S or HE’S depending on who you are giving it to. caring, smart, funny, nice, energetic, prepared, helpful, responsible, quick-witted, smart-cookie, smiley, stylish, infectious laughter, perfect, strong, awesome, refreshing, charming, kind, brave, courageous, breathtaking, ray of sunshine, impressive, great listener, beautiful, cool, incredible, bright, interesting, wonderful, cute, stunning, one-of-a-kind, inspiring, grateful, appreciative, hard-worker, talented, great example, magnificent, breath of fresh air, thoughtful, creative, irresistible, lovely, extra-ordinary, unicorn, treasure, special, gift to others, stunning, enticing, exciting, bold, breathtaking, intriguing, unique, generous, wondrous, spunky, striking, outgoing, pleasant, confident, cheerful, gracious, honest, trustworthy, helpful, musical, entertaining, delightful, brilliant, awe-inspiring, phenomenal, interesting, dreamy, strong, handsome, considerate, reliable, adorable, studious, extroverted, beloved, amusing, charitable, authentic, accomplished, calm, capable, confident, compassionate, cooperative, curious, considerate, desirable, dynamic, daring, delightful, devoted, determined, excellent, energetic, dazzling, imaginative, hopeful, happy, fabulous, giving, genuine, glorious, innovative, heart-warming, insightful, joyful, jovial, kind-hearted, open-hearted, leader, logical, optimistic, loyal, lovable, noteworthy, positive, peaceful, quirky, nurturing, organized, playful, respectful, righteous, super, selfless, wild, welcoming, tranquil, stylish, supportive, silly, understanding…I’m sure there are many more! Add on a cute bow, and you have an easy but thoughtful gift that anyone would enjoy! Aw! This is adorable! 🙂 I love heartfelt acts of kindness paired with unhealthy confections! 😉 Thanks for sharing! Excellent idea! Compliments and chocolate are a perfect combination! What a sweet way to show someone you care! I think compliments really can brighten a person’s day. I love the idea of a Compliment Bar. It is such a nice way to show someone you care. 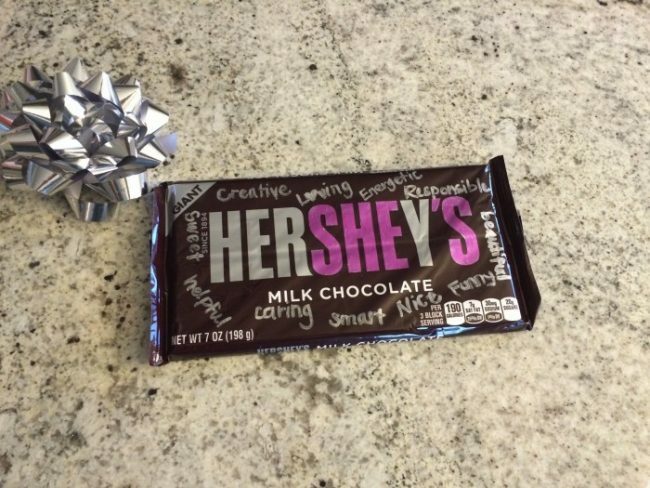 I think a Compliment Bar is a great way to make someones day. I will have to get the supplies I need to make some to give out. What a cute idea. This would make anybody’s day. It’s a great way to help someone feel good about themselves. I think this is a tasty idea! I am sure my husband or ids would love this! I think this is a super adorable idea. I need to do this for my kids. They’ll love it. This idea is something that you could do any day of the year. It would totally lift someones spirits! This is such a cute idea. I wish I would have done something like this for all of my friends. What a cute and fun idea! So nice to give someone compliments, they go a long ways. That is so adorable. I am going to have our girls do this at our next weekend retreat. What a great idea! We all love to hear complements and they don’t come along nearly as often as they should! That is a really sweet and thoughtful idea. Who wouldn’t love that?